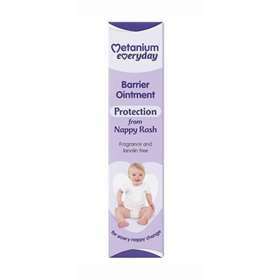 Metanium Barrier Ointment 40g is an everyday nappy rash cream which has a gentle formulation and is suitable for most skin types. Metanium Barrier Ointment contains a unique formulation that assists the skin maintain its natural moisture, keeping it soft and supple. Apply a pea sized amount to the skin, gently spreading the barrier ointment evenly to form a thin protective layer. A barrier ointment used on your baby's skin at every nappy change can form part of a healthy skincare routine. If swallowed, seek medical advice immediately and show this carton. Do not use if there is any broken, badly cracked, infected or bleeding skin. Titanium Dioxide, White Soft Paraffin, Light Liquid Paraffin, Dimenticone.